We specialize in the supply of Polythene & Polypropylene bags for Point of Sale Display. We manufactured to Customers own specification to enable you to personalize your retail product presentation. Our HEADER BAGS are high quality custom-made polypropylene bags with a re-enforced integral header designed for hand packing small flat lightweight products. There is a wide variety of design options – top or bottom fill – plain or printed – euro-slot or round hole in header – permanent or reseal-able seal. Due to the wide variety and options available header bags are produced to order with a minimum order quantity of 5,000 pieces per size, with higher quantities required to maintain viable costing. For your convenience we provide PLAIN HEADER BAGS FROM STOCK for those times when you have an immediate need to package your product. 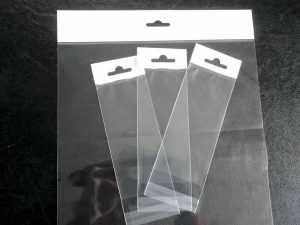 Plain Header bags with White 40mm reinforced Header and Euro-slot – bottom fill, OPP40mu film. A member of the Woldpac Group supplying unique packaging for any business. Copyright © 2019 Woldpac. All Rights Reserved.